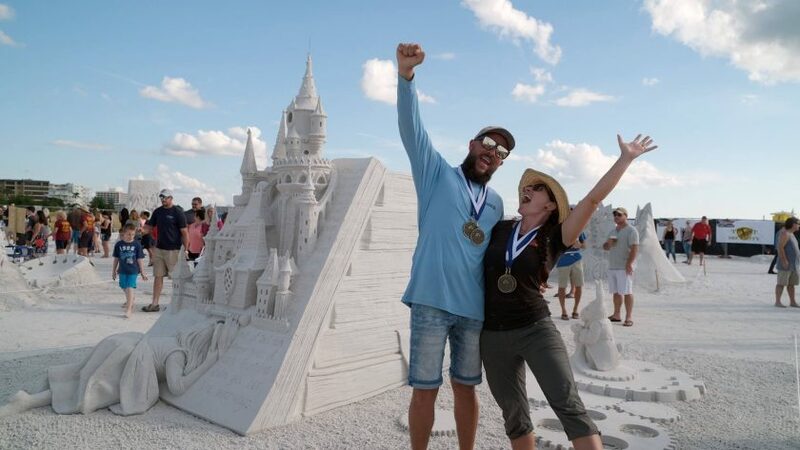 This year the Siesta Key Crystal Classic International Sand Sculpting Festival brought in over 65,000 attendants, surpassing attendance rates since the festival’s inception eight years ago. Sand sculptors take part in this competition not only for the title, but because the sand on Siesta Key Beach is known for being cool and soft to the touch, making it perfect for sand sculpting. 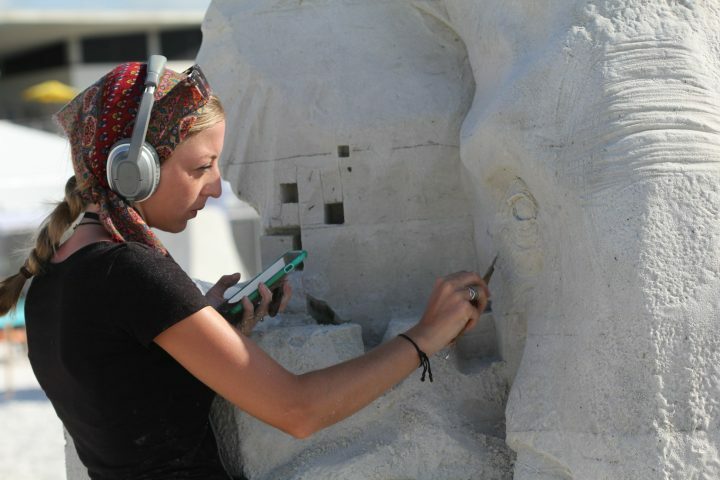 Rachel Clara Stubbs working on her sculpture “An Ode to Endangered Species” which would earn her second place in the solo division. 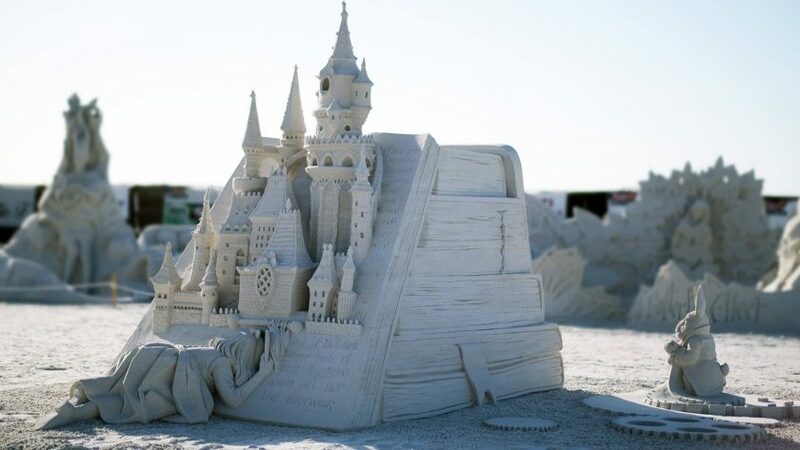 According to the festival’s webpage, the competition was created eight years ago to boost the local economy and present sand sculpting as a medium of art. The organization claims that in 2017 the festival brought in an additional $9 million in tourism revenue to the Sarasota area. This year, over 60 vendors signed up to host booths at the festival, selling a variety of clothing, accessories, fine jewelry and food. According to Ivey, 61,000 people attended last year’s festival. The festival’s attendance has grown by about 50,000 people in the last eight years; roughly 10,000 spectators attended the first festival in 2010. This year surpassed previous attendance records with over 65,000 visitors. “Alice Down the Time Hole” won people’s choice, sculptors choice, and first place for the team division. “Alice Down the Time Hole” by Melineige Beauregard (Canada) and Andrius Petkus (Lithuania) took home first place for doubles (overall), sculptor’s choice and people’s choice. “Time is What You Make of It” by Maxim Gazendam (Netherlands) won first place in the single category (overall) and sculptor’s choice. “The Tears and Beers of a Clown” by John Gowdy (United States) won people’s choice award for solo artist. The competition had seven judges who looked for sculptures that met criteria specific to the form and method of sand sculpting. All of the judges have a background in art, which is one of the qualifications to be a festival judge, and almost all of the judges are part of the local art scene. The group is a combination of artists, art studio owners, employees from local art museums and professors from Ringling College of Art and Design. One of the interactive activities the event provided was sand sculpting lessons for children. The event had several interactive options for guests. 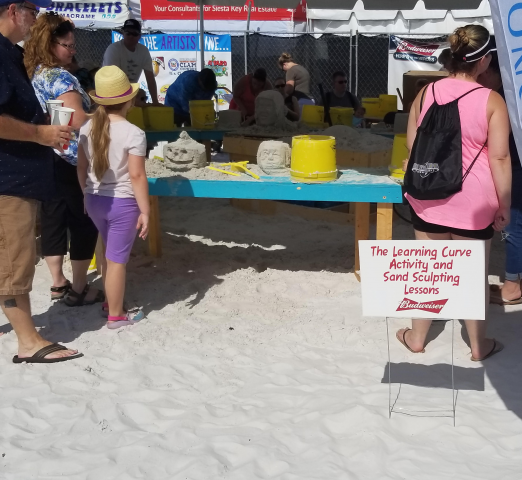 The Quick Sand contest is a demo in which two master sculptors have 10 minutes to sculpt a masterpiece, one of which is then declared the winner by the audience. The festival also held an amateur competition on Saturday, in which anyone could sign up and create works of sand art. There were four competition categories: Turtle Bale (team of up to four members), Hatchlings (a single or duo of children under 10 years old who may receive verbal coaching from parents), Loggerheads (a single or duo of children 10 to 17 years old) and Leatherbacks (a single or duo of members 18 years and older). The first prize winner of each category won $100. Ivey encourages New College students and alumni to check Facebook for next year’s event, and stresses that volunteers are always needed. 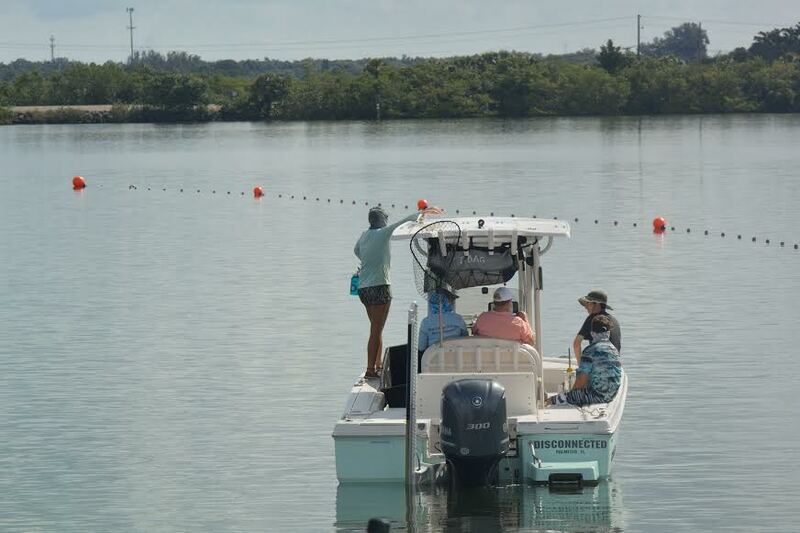 Information for this article was gathered from VisitSarasota.com and siestakeycrystalclassic.com.